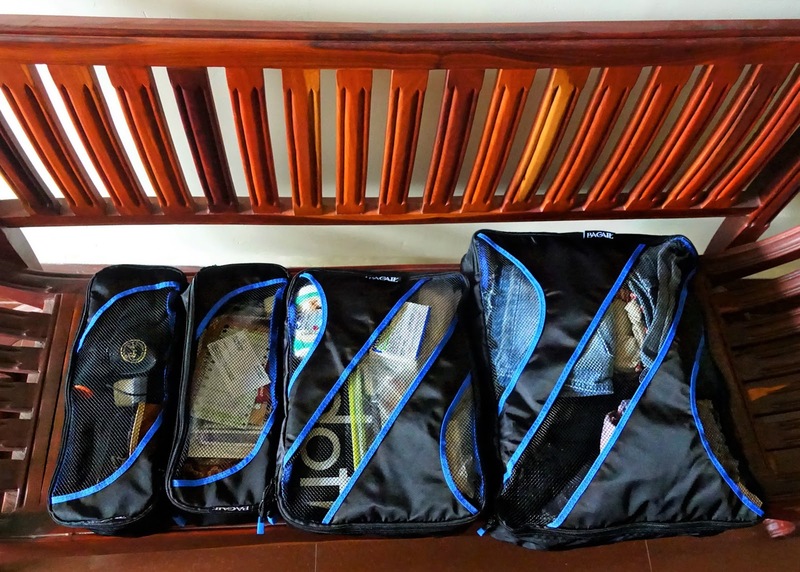 Being a couple of months into my travels around Southeast Asia, I was super excited to start using the reputable Packing Cubes for the very first time. My husband met up with me in Vietnam for a two week holiday and kindly brought them over for me and I have to say – these have made my life so much easier! From the moment I opened my package, I was highly impressed. 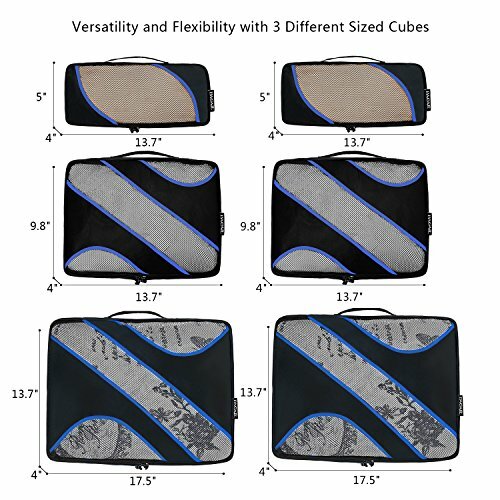 The cubes are very lightweight and can pack up very neat and small. I picked my favourite colour (black) which comes with a striking blue lining design. This set of six cubes comes in three different sizes: small, medium and large and you get two of each. They have a mesh lining on top and the material and zippers are excellent quality and feel very durable. Let me start by showing you just how unorganised my suitcase was before I started using the packing cubes. Basically I used my own version of cubes in the form of multiple plastic bags… it was a bit of a mess to be honest! As I still had 8 weeks to go on my travels I actually offloaded a lot of stuff I wasn’t using to my husband to take back home for me so I could travel extra light, and I also gave him two packing cubes to use himself. I thought four was the perfect amount for me to use personally. I use the large packing cube for my clothing that I don’t wear every day. This includes my jeans and sweatshirt (mostly for plane travel) and jean shorts and skirt, cardigan etc. I like to keep the rest of my clothing that I do wear daily such as t-shirts and singlets easily accessible so I prefer to keep them loose in my suitcase. I use the medium packing cube as my sort of ‘medical and extra toiletries kit’. In here I keep my spare toiletries and medication, washing powder, tissues etc. and I really appreciate how much more organised these products are, now I know exactly where to find them all! For the two small packing cubes, one I use as my ‘electronics bag’. In there I keep my various chargers, spare batteries and memory cards, my Go Pro and accessories and also my spare sunglasses. The second one is my ‘random stuff’ bag. In there I keep little presents and knickknacks I’ve purchased such as key rings and post cards and any receipts and papers I wish to keep. I only have one other large plastic bag that I keep my shoes in and two of my own toiletry bags that I constantly take in and out of my suitcase – one for my makeup and one for my everyday care such as shampoo and conditioner, face wash, toothbrush, soap etc. and I feel this works really well for me. I am so pleased with how organised I now am and I actually feel like more of a proper traveller because of it! 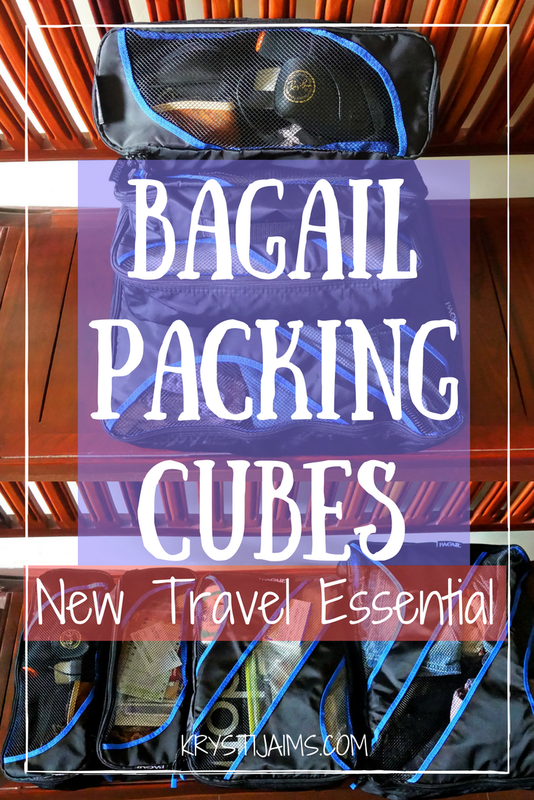 I have been using the Bagail Packing Cubes for over three weeks now and I can’t believe they hadn’t been in my life earlier! They have become a new travel essential for me and I know I will get so much use out of them for every single trip I go on. It has minimised the amount of plastic bags I use, uses up a lot less space and makes finding things a heck of a lot easier. The different sizes and mesh front means I no longer have to hunt for items and it also helps clothing to breath and be odour-free. I love the style, the quality and how they make packing such a breeze. My suitcase is so neat and tidy now and 1000 times more organised. This product would suit every type of traveller and I highly recommend it to all. 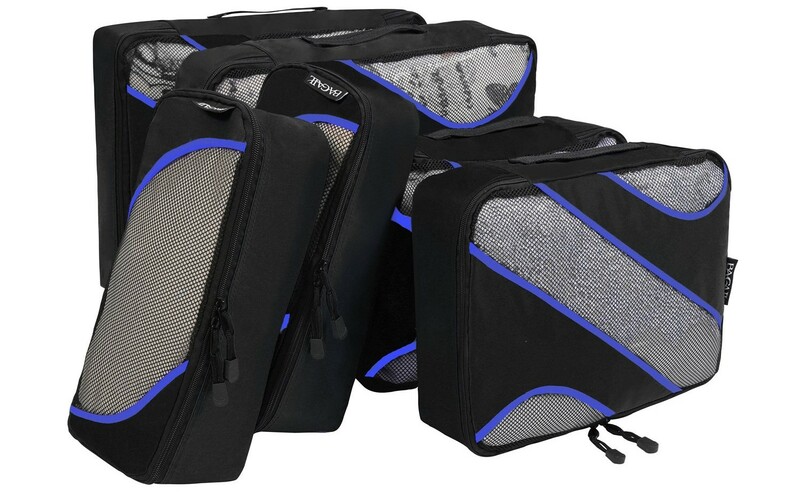 This Bagail Set has six Packing Cubes – 2 Large (17.5″ x 13.7″ x 4″) 2 Medium (13.7″ x 9.8″ x 4″) and 2 Slim (13.7″x5″x4″). They come in a choice of seven colours – as well as Black, it comes in Blue, Dark Blue, Fuchsia, Grey, Burgundy and Purple. These can be easily purchased on Amazon or through their website. Do check out Bagail.com if you would like more information and to see a bunch of other great products they have too, from Travel Shoe, Laundry, Makeup and Toiletry Bags to Handbags, Backpacks and Duffel Bags. They have a warranty guarantee and 60 days of free return shipping. Disclaimer: My set of packing cubes were complimentary in exchange for an honest review. All opinions as always are my own.